Was it some sort of military requirement to "get 'em down ASAP," or to simulate a lunar re-entry profile, or a need for a shorter orbital arc from retrofire to re-entry to minimize any guidance (“aiming”) errors during the de-orbit maneuver. 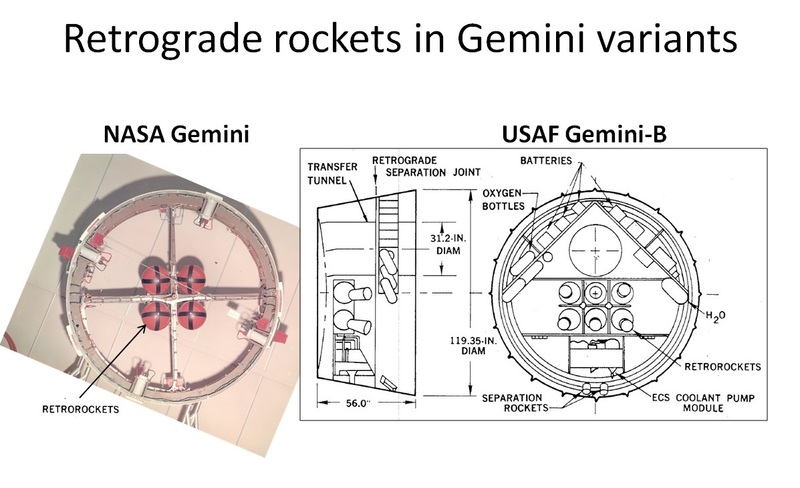 The first two seem unlikely, but the shorter arc was mentioned by a few experts as being a factor in NASA Gemini re-entries. 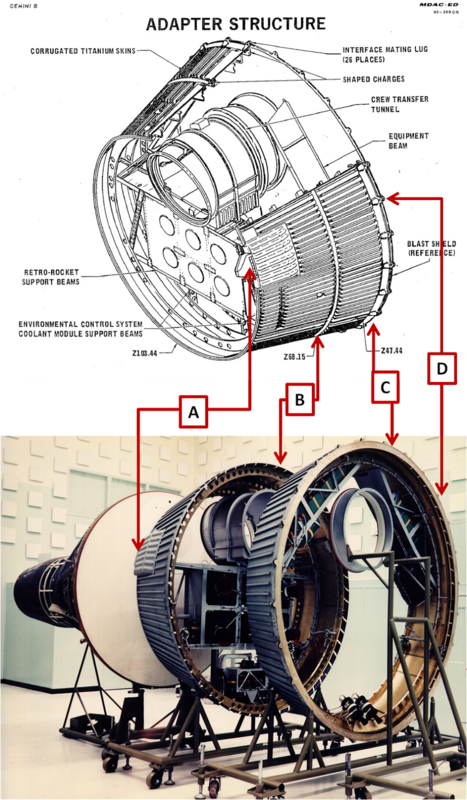 Using an even shorter arc on Gemini-B might have stressed its heat shield with more thermal loading than Gemini experienced. But a re-entry test validated the modified heat shield with a plug hatch cut into it under similar conditions as for the original Gemini heat shield. 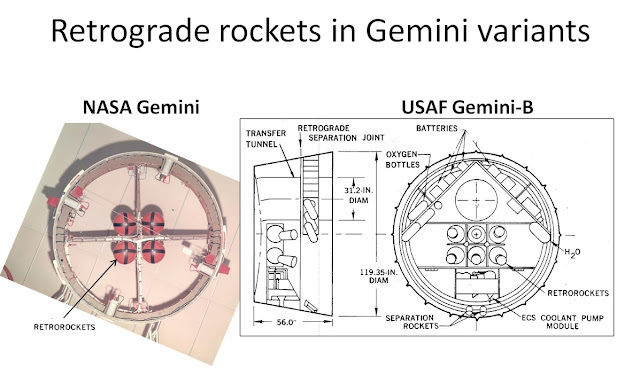 Clearly the re-entry conditions for Gemini-B were planned to be the same as for Gemini. 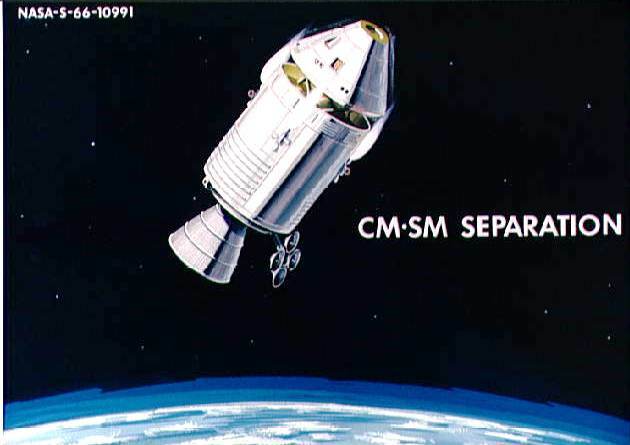 Gemini-B/MOL would have been in an even lower orbit than Gemini to improve its high-resolution Earth photography, and constant atmospheric drag would have been slowing the vehicle enough to de-orbit it in hours or days. This would surely have required frequent orbital boosts from the onboard maneuvering engines in the MOL’s Attitude Control and Translation System (ACTS). 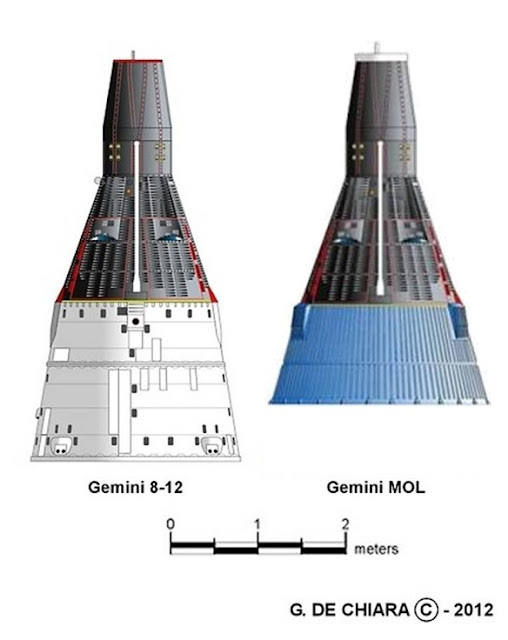 Mockups and images of MOL from late in its design phase show the largest ACTS thrusters were those pointed to the rear (“+x” in spacecraft parlance) (Figure 6) to speed up the MOL. 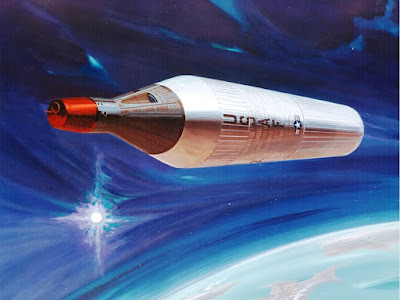 There didn’t seem to be any thrusters at all pointed forward; maybe the designers didn’t foresee any need to slow MOL down more than atmospheric drag would already achieve. Table 3. Maximum circular orbit for Gemini-B consistent with de-orbit using six retrograde rockets, compared with highest (initial) and lowest (final) MOL orbits (see Reference 5). * The six rocket motors would weigh 58.7 kg (129.4 lb) more than just four on Gemini, until they were fired. The film canisters from the KH-10 DORIAN cameras, assuming four of the type flown by Corona reconnaissance satellites at weighing 36 kg (80 lb) each, would add 145 kg (320 lb) more than Gemini. This was estimated based on data retrieved from searches on various websites, including the National Reconnaissance Office collection of declassified documents; see for example http://www.nro.gov/foia/CAL-Records/Cabinet2/DrawerC/2%20C%200052.pdf (accessed Sept. 27, 2015). 1) if there's a major malfunction requiring the MOL be abandoned quickly, the Gemini B needs ample crossrange dV to reach its recovery point and not land in enemy territory or inclement seas. 3) a major solar flare / CME puts crew lives at risk. All of these reasons necessitate a lot of dV to go crossrange and reenter quickly. 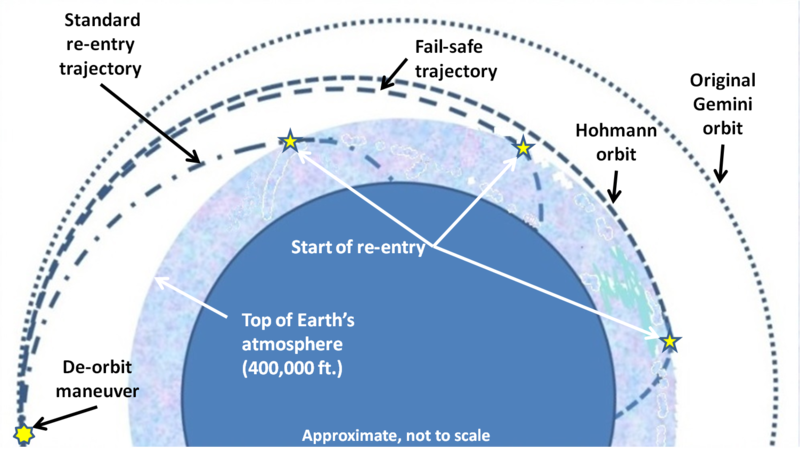 4) MOL was also envisioned to go into molnya orbits to make fast passes over target areas (which also enables significant rapid orbital changes at apogee that ground targets could not predict). They would need more dV to lose velocity on reentry from this sort of highly elliptical orbit. Mike, thanks for these interesting contributions. Part 2 in this series will address the cross range capability (spoiler: it's not very much). The Molniya orbit option is interesting, but I don't recall seeing it mentioned anywhere. Without an upper stage, like the Transtage, I don't think it could go into a very high-apogee orbit even on the Titan-IIIM. The Transtage was included in early contractor proposal models and artwork, but did not appear to be part of vehicle design in the late 1960s. Of course, it might have been added to a later version if MOL had been adopted as an operational system. But then, additional retro rockets could have been added during the same re-design, instead of being carried on the early version. I will try to finish up Part 2 soon, and hope you will share your thoughts about it.